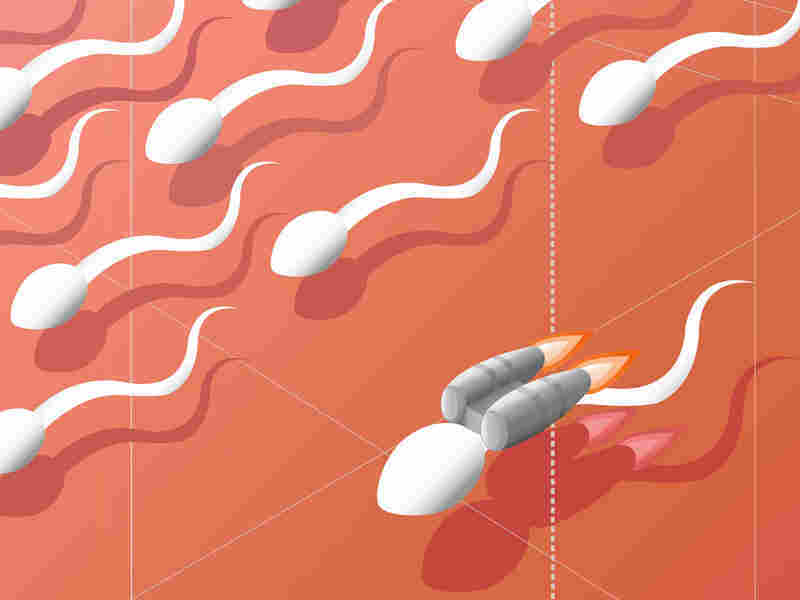 Tail Switch Gets Sperm Swimming : Shots - Health News Researchers say a valve in the tails of human sperm controls when they start moving. When the acid level drops inside the sperm, they start to wiggle. Your parents may have taught you about the birds and the bees, but they probably never explained exactly how human sperm get their move on. The particulars of the environment sperm find themselves in make all the difference. If the surroundings are acidic, then sperm sit tight. But if things are alkaline, or basic, which is the other side of the pH scale, then sperm hightail it. Now some researchers in California say they've found the molecular switch that kicks human sperm into gear. Scientists at University of California, San Francisco, say a channel in the wiggly sperm tail regulates their internal pH and serves as the ignition switch for action. Since Mom and Dad didn't tell us about this way back when, we turned to Dr. Yuriy Kirichok, lead researcher on the work, which appears in the current issue of Cell. "If pH is low, sperm can pretty much do nothing," he told us. "If you elevate the pH, the motility starts, and the higher the level of pH, the more motile they are and the better the chance of fertilization," he said. Still, the mechanism for the progressive increase of the pH within the sperm was previously unknown. Kirichok's team identified the molecule that looks to play the most important role in changing the pH inside the sperm, a one-way valve, or channel, called Hv1. The channel is "extremely sensitive" to the pH outside the sperm, Kirichok said. So, when sperm are ejaculated into the female reproductive tract, where the pH is mostly more alkaline, then the Hv1 channel opens up. That let protons leave the sperm, raising their internal pH. The sperm then start swimming furiously toward the egg. That's a complicated journey; for more scientific info try this. It's possible that work on Hv1 could help scientists find new ways to control male fertility. "I cannot promise that something like an activator or inhibitor of Hv1 would be available in the near future," Kirichok said. "But Hv1 is a good candidate for that, definitely."